After a full day of flying (and waiting for connecting flights) I made it to Louisiana. I met my lovely friend Lynda (who had joined me from Atlanta) and driven the 2 hours from the airport to Lafayette, Louisiana. Heart of Cajun country. Lafayette, and rightly so, has become known for the Cajun food scene boom and the town certainly lives to eat! (my favourite motto in life). So our first question when we arrived at our guest house (Blue Moon Saloon by the way if you are interested) was where to breakfast in this awesome little town? On a recommendation from a chef, who works the oil rigs and stays at the guesthouse on his breaks, we headed over the The French Press on E. Vermilon St (across from Parc San Souci). The building was originally an old printing warehouse and the original flooring (and a few relics) have stayed. It's open and airy and oozes old times yet with an air of modern times with it awesome steel and concrete cocktail bar at the back. I'm instantly drawn in. 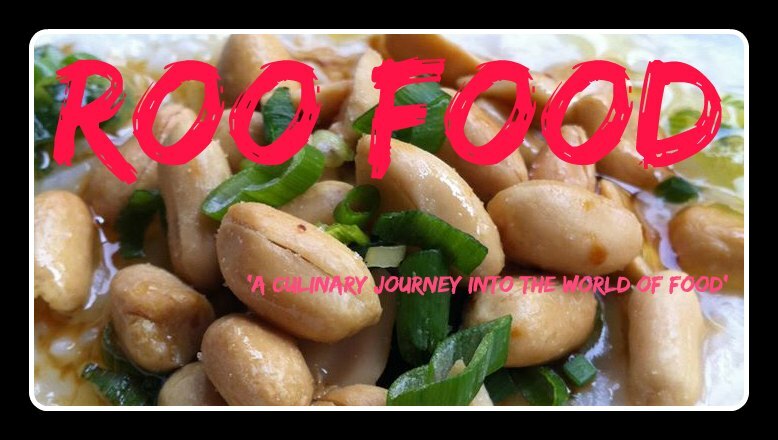 The menu is not extensive, however it's mouthwatering. An appetiser breakfast menu is also on offer too. Locals are breakfasting and it's clear that a french press coffee and glasses of Bellini's are the preferred beverage. We start with coffee (and french press coffee the next morning). Decisions are hard and in the end we ended up with this array of deliciousness. First day we opted to share a few plates. Sweet Baby Breesus - one each ($2.50 each from the appetiser menu (or you can get a full serve on the main menu), a serve of praline bacon and the Cajun Benedict to share. 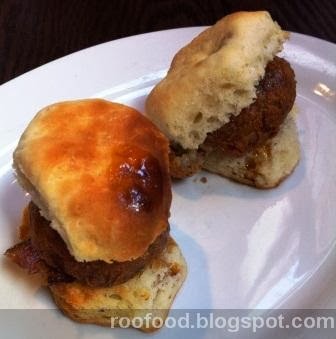 Buttermilk Biscuit Slider with Bacon, Fried Boudin Balls and Steen's Cane Syrup. All I can say is holy mother of.......... this was seriously one of the best things I ate in Lafayette (and that is saying something with what's to come!). Boudin is a Cajun sausage which also has rice in it. You can eat it all kinds of ways. steamed, fried, in or out of the casing, fried into balls....you name it....I did get to eat it a few ways and personally fried balls is my favourite. The second 'I need a moment to myself' moments - praline bacon. This is seriously porcine crack. Thick centre-cut bacon candied with brown sugar and pecans - this serve is just no where near enough for anyone! 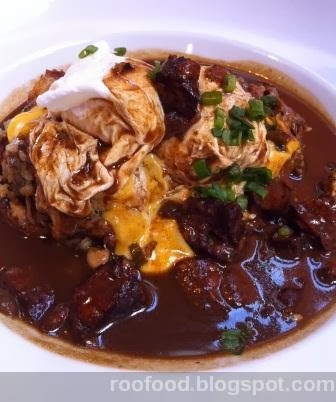 and two poached eggs, topped with chicken and andouille gumbo and fresh shallots. The gumbo was thick and hearty and meaty and rich. The boudin was mixed through the gumbo. The eggs were perfectly gooey in the middle. This is one hearty dish and will fuel the body for the day! We backed up the next morning for another go at the menu. We just couldn't get enough of this place. 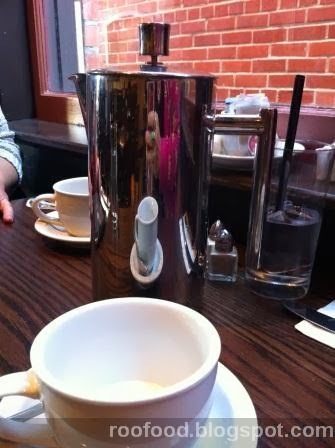 We shared a french press of coffee ( I will admit I had a hard time getting decent coffee in the US). .....but we opted to go our own way today and had our own dishes (no sharing today). 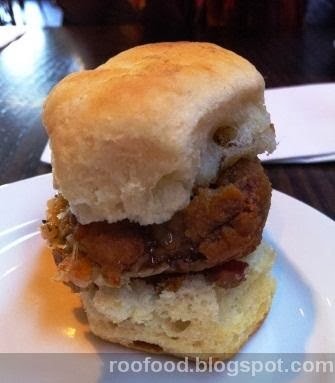 I started with a Sweet Baby Breesus again and it was deja vu, as I sat silently savouring every mouthful. I also followed with with the chicken and waffles, which was LeBlanc's cane jelly fried chicken, 2 cheddar waffles and Steen's cane syrup. 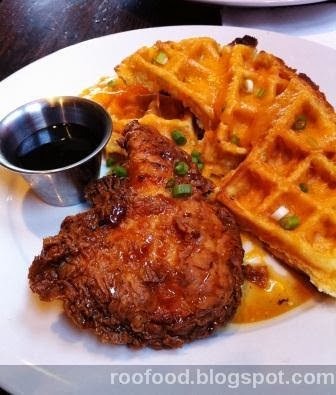 You can't get much more southern than chicken and waffles with syrup! This was fried chicken heaven and the Steen's cane syrup is seriously addictive (in fact a bottle found it's way home with me). The cheese waffles were okay. I think I would have preferred them plain. Lynda opted for the Grits and Grillades. 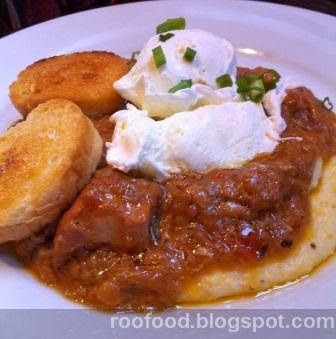 This had ground grits with Uncle Sammy's grillades, stewed tomatoes and two poached eggs. What is a grillade? 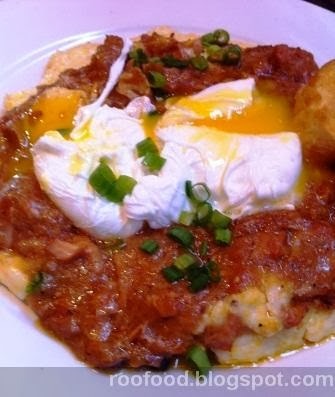 It's basically medallions of meat stewed to fork tenderness with vegetables and served over grits typically for breakfast or brunch. When the original dish came out the poached eggs were very overcooked and rubbery, so we asked if we could get new poached eggs. The staff were extremely apologetic and whisked it away to fix it. Not only did they remake the whole dish again but they also didn't charge us. Thankyou French Press, your hospitality went over and above expectation. We were extremely thankful as Lynda was just happy to get new runny eggs! I cannot recommend this place enough. If you are ever in the area please go. Phenomenal food and service! Definitely one of the many highlights of our stay in Lafayette. 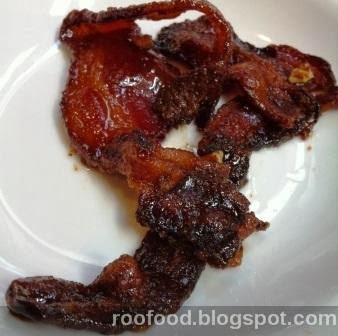 Candied bacon?! Argh why did we drive through Lafayette and not stop for a roadtrip snack! I still dream about that place!